Yeah, now they're reduced to hot gluing cheap switches to the dashboard of an expensive sports car! 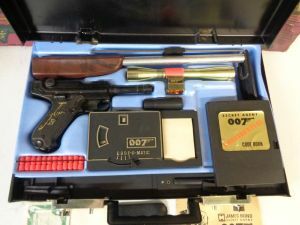 dirtybenny wrote: I'm more than happy to discuss "prop" or "make believe" guns, anything to help further firearms understanding and add to a fellow classic fan's enjoyment of Bond! 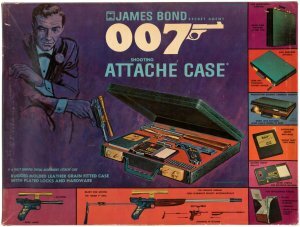 Here is the classic James Bond attaché case by Multiple Toy Makers from 1965. 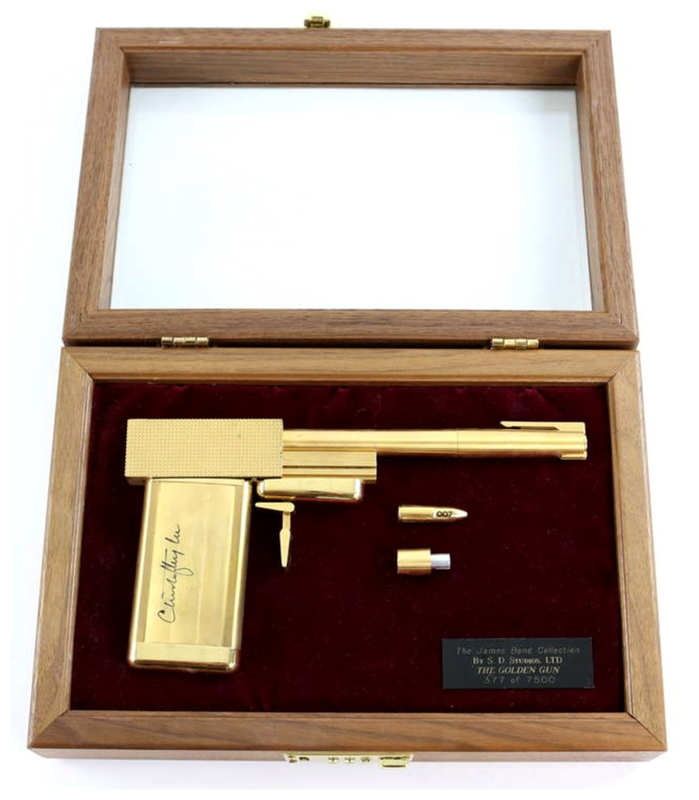 It had a mechanism to shoot plastic bullets from the case itself, and check out the pistol in the case. It's a Luger pistol for some reason. that's a very interesting bit of kit there Count. I wish it had been around when I was a tike! I think the went with the Luger looking pistol because it fits in to the fore stock attachment in the case. dirtybenny wrote: I think the went with the Luger looking pistol because it fits in to the fore stock attachment in the case. Is Luger the only pistol you can fit a stock to? This is not possible with a Walther P38 for example? I suppose the could have done it with a wide variety of pistols, I figure the exposed barrel dovetailed much easier to the stock, the P38 would have also been a prime candidate. Me too O, it's the Walther WA2000 and if you can find one they go for nearly 6 figures! Bourne used one in the second film, which considering the price and scarcity would be impossible. Interesting piece not sure it's 7000 interesting, but interesting all the same. The AR-7 rifle in FRWL was cool as well and was a real-life gun. Since 1959 the venerable AR-7 has been the choice of U.S. Air Force pilots who need a small-caliber rifle they can count on should they have to punch out over a remote area. Through the years the AR-7’s reputation for portability, ease of operation and reliability has carried over to the civilian world. Today it’s a favorite of bush pilots, backpackers and backcountry adventurers who, like their Air Force counterparts, need a rifle that’s easy to carry yet has the accuracy to reliably take down small game. I was always fascinated by the AR-7, unfortunately it wouldn't be as effective as depicted in FRWL due to it's small caliber (.22) even as described in the film (incorrectly as a .25) I don't think it would have been capable of hitting Krilencu at distance or incapacitating the helicopter co-pilot. dirtybenny wrote: I was always fascinated by the AR-7, unfortunately it wouldn't be as effective as depicted in FRWL due to it's small caliber (.22) even as described in the film (incorrectly as a .25) I don't think it would have been capable of hitting Krilencu at distance or incapacitating the helicopter co-pilot. Bond and Kerim Bey weren't that far away from Krilencu though, they were on the other side of the street basically. They shot Krilencu twice and he probably died from the fall rather than from bullet wounds. Remember he yelled while falling. The man in the helicopter got shot in the arm or hand which resulted in him dropping the hand grenade and it exploded inside the helicopter. Bottom line is the filmmakers didn't portray these things in a particularly unrealistic way, I think it could have been possible after all. 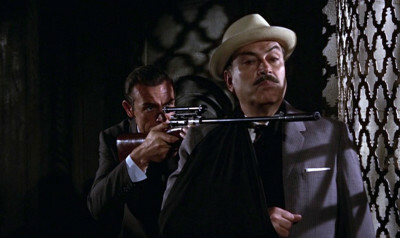 FRWL was an early Bond movie which still tried to be realistic as opposed to many later films in the series. I wasn't inferring the use of the rifle was unrealistic, certainly not in the hyper-realism of Bond, especially when you compare it to the ridiculous use of Craig's PPK as an anti aircraft gun in SPECTRE. My main reason for pointing out the rifles short comings is educational, I intended this thread as a means of discussing firearms and teaching the uninitiated so they can have a fuller appreciation of what firearms are capable of in the real world. Far too often films show people flying through walls when shot with the smallest of guns not to mention the aforementioned scene in SP. One got the impression you thought it was unrealistic though. Most people probably know .22 is a small caliber, you don't have to be an expert to know this.